Made from acid-free, archival-quality polypropylene. For 11" x 8 1⁄2" document storage. Hook and loop closure. Fits standard 3-ring binders. 1" gusset expands for additional capacity. Assorted color varies. 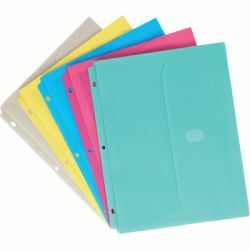 Clear specialty binder pockets are made from polypropylene, which contains an additional additive.